Read on to find out how you can revamp your home without the high cost! Step One: Plan Well Ahead. When I moved into the house, I stupidly thought I could get the whole of the downstairs (the living room, bathroom, kitchen and hallway) done before Christmas. 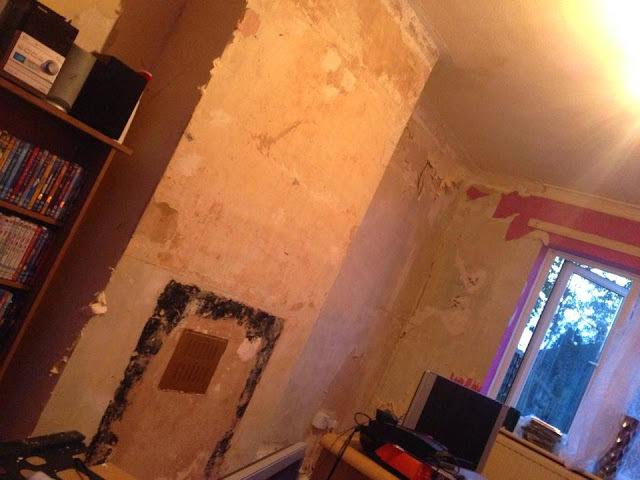 33 months in and I've only got the front room done and the hallway plastered, unless you're a millionaire or flush with cash, plan well in advance for any home renovations that need doing. I didn't plan for us to come across things no household wants to find, including damp walls, rotten skirting boards and damaged door frames. Step Two: Tackle One Room At A Time. You may want your whole house done within a certain time, but be practical, getting a number of rooms done at the same time can not only cause havoc for those who're doing the work, but it can cause havoc for the household too. When we got a new kitchen put in, everything, and I mean EVERYTHING from my kitchen got put into my living room - could you imagine if I was having the living room done too!? Everything from the front room and kitchen would've had to be taken upstairs, the bedrooms don't have room for a small box let alone two rooms full of bulky furniture and appliances! Step Three: Hire A Local Tradesman. Hiring a company to do the work you need done will be handy in some sense, but you can be sure it'll come at a high cost! Instead, find a tradesmen and you'll find you can save yourself a small fortune! When I had our living room done, I found lots of companies that could do all the work for me, but hiring the professionals separately ending up saving me over £350! I hired a carpenter for my door, door frame and skirting boards, an electrician to do the light and light switch, a plasterer and a painter & decorator - all individually. Yes there are companies who can provide all of those in one, but they come at a high cost! The savings I made helped me get a new kitchen - something that wasn't on the list due to the price of it! Step Four: Check Out Local Free Sites. When I left the flat, I packed up everything (bar the rubbish of course!) and took it all with me to the house. Not only did it take up more packing time, and then unpacking time, but I had no need or use for the old accessories from my flat due to the change of colour schemes I had in my house. I offered the accessories away on local free sites bulking items together like purple kettle, toaster and microwave, purple cutlery and utensils including holders, purple washing up bowl, cutlery drainer and drain rack - the items went within a few hours of me putting them up! If you're in need of accessories check out your local free sites and don't be afraid to ask! The boxes of purple items I had from the flat was sat in my attic for four months before I had the idea to give them away! If you're in no rush to revamp your home, then the sales can be a big money saver! Quite often, brands change their logo's or packaging designs, the products haven't changed but because the brand wants the new packaging on the shelves, stores will reduce the old style packaging. I managed to get some good quality, well known branded paint for only £3 from a nearby hardware store! The original price tag was £30 a tin, I picked up three tins for £9 - yes it means storing it, but I know it'll come in handy! Some of my family members joke that I'm a hoarder, but become envious when I tell them my room makeover only cost £50, I may of been buying accessories and paint over the course of three years, but my room is revamped and restyled on a budget I'm happy with! Do you have any other tips? I'd love to hear your thoughts below!